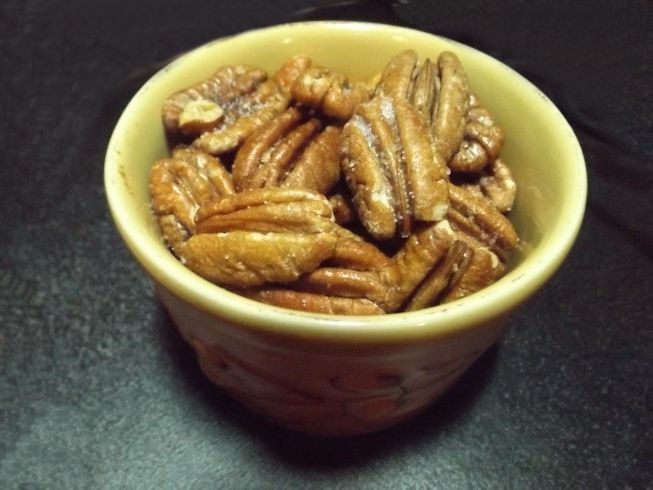 An incredibly easy snack to make is salted, buttered, roasted pecans. My friend Joanna makes these each year and my mom has been known to crank out a few herself. I ran across this recipe tonight and thought I’d give it a try. On our way to Florida we stop in Vienna, GA at the Ellis Brother’s Pecan store. It is a must see if you are going down 75 south to Florida. They have a great shop full of pecan samples as well as a gift shop and then across the street there is a cotton field (they are multi-product farmers). Each year they leave about 1/4 of an acre for their customers to pick some cotton bolls to take home for free. Now that seems so charming and oh-so-southern, however you pick at your own risk. The last time I went that way was with Davis for a college visit to Florida State. We made our usual stop for pecans and cotton. I was even super-prepared and brought my own scissors to speed up the process. As I was heading out the door of the shop, the cashiers told me to help myself to the cotton, but…. (there just had to be a but) to watch out for rattlesnakes! AND to make matters even more dangerous and dramatic, the minute I stepped out of the shop and into the field, a freak thunderstorm developed and I could actually see lightning zinging down in the fields. Did snakes and lightning deter me in the face of free cotton? Hardly. I moved my car over closer to the field and then would leap out in between bolts and rattles to grab a stem of cotton. Finally after gathering a meager bouquet, I came to my senses and got back in the car and called it a day. My dreams of authentic southern decor came to an end on that blustery, electrified, and snake-infested day. I came home and priced cotton on Amazon and will have to be content with somebody else’s stash. Preheat oven to 325 degrees. Pour melted butter over pecans and place on a cookie sheet in a single layer. Bake for 25 minutes stirring several times. Lower the oven heat to 300 if the butter starts to scorch. Remove from oven and sprinkle with salt. Add cayenne, if desired. Julie, I really liked this blog about the cotton bolls. When I was a little girl my grandfather grew cotton on his farm. I never lost the love for seeing fields of cotton and the memory of picking that soft bit of cotton. Love the pecans.